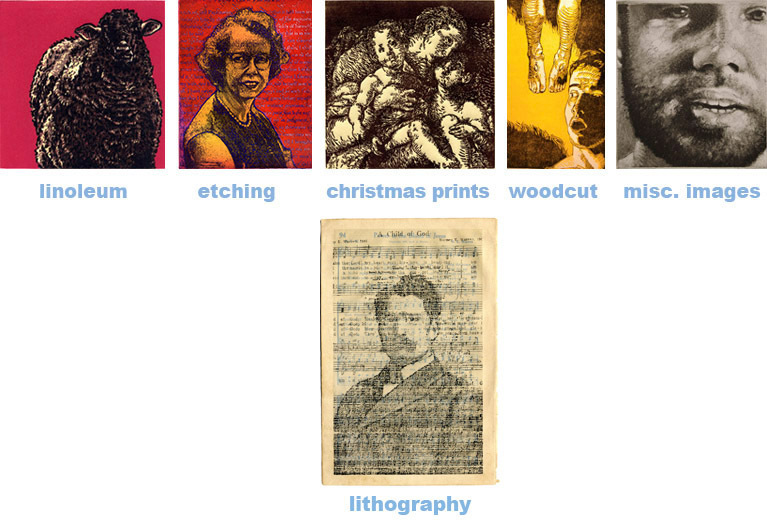 There are several different forms of printmaking represented on this website. Relief prints include both woodcuts and linoleum prints. Intaglio prints include several etching processes. There are also some monoprints and lithographs. Click on the images to the left to find out more about each process and see works within a particular series. As a printmaker, I take special pride in the work that I do. My prints are created as a specific artwork that can be issued as multiples. Many artists, dealers, and galleries use the word "print" to describe a "reproduction" of an image that exists in another form, usually as a painting. These reproductions, though they might have lightfast inks and be printed on archival paper, are little more than a high grade poster. Consumers and collectors should be well informed before making a purchase of any artwork called a print. I design, carve, or etch all my own blocks and plates and then print them myself--either by hand or on a press. Some artists work with master printers in a collaboration that ends in the same result. Feel free to contact me at inquiries@tyrusclutter.com for more information about printmaking and the print market.